Dave Nonis believes the building blocks are in place for the Toronto Maple Leafs. Now it's up to him to add to that foundation. Nonis, promoted Wednesday to replace Brian Burke as general manager of the Leafs, knows the construction job won't be easy. "We have some good building blocks," Nonis said during his introductory press conference. "We have some good players. … [but] some of those building blocks aren't ready to play here yet. We have to find a way to bridge that gap. "We need to continue to search for players that can play right now, that can buy us a little bit of time for those young players to come along. We have strength, there's no question. We have improved over the last 48 months in terms of our on-ice product, but we have some work to do and we need to make some changes to our lineup." Junior stars set to make impact in NHL? While the Leafs did not make the playoffs during Burke's four seasons, the team did build up a quality farm system. Defenseman Jake Gardiner, 22, made an impact last season in the NHL, leading all rookie blueliners with 30 points in 75 games. He also was part of the group that helped the Leafs' American Hockey League affiliate, the Toronto Marlies, reach the Calder Cup final. Other important youngsters with the Marlies include centers Nazem Kadri and Joe Colborne, each 22; right wing Carter Ashton, 21; and defenseman Jesse Blacker, 21. There's also a strong group playing junior hockey, including forward Tyler Biggs and defensemen Matthew Finn, Stuart Percy and Morgan Rielly. "Looking back on this team four to five years from now, I think people will say that a lot of things Brian Burke did were very positive and helped this team become successful," Nonis said. Because of the talent on the team now -- forwards Joffrey Lupul and Phil Kessel, and defenseman Dion Phaneuf, among others -- Nonis said he sees no reason to begin making trades and start from scratch. "We need to continue building the team," he said. "It's not starting from scratch. … To gut it now will set the franchise back a long way and something we're not interested in doing." That thought of keeping things intact carries over to the coaching staff, where Nonis said Randy Carlyle, hired in March 2012, will be leading the team when the 2012-13 season starts. "Randy is a quality, quality head coach," Nonis said. "We're fortunate to have him. We think as a management group that our players, the youth of our players, the direction we want them to head, requires a coach like Randy Carlyle and we're thrilled that he's going to start the season with us." Nonis said he'll be patient with his team, a quality he sees as one of his strong suits -- and something that separates him from Burke, his longtime friend and frequent co-worker. The pair worked together with the Vancouver Canucks, Anaheim Ducks and Toronto. "If there's one difference, and it may be positive or negative depending on how you look at it, I'm a little more patient in how I approach things," Nonis said. "Evaluate things a little bit longer." The evaluation of the group he'll put on the ice this season, however, will have to come a bit faster. Training camps for the 2012-13 season are expected to open no later than Sunday, and Nonis said he and the Leafs management staff already have a plan in place. "We don't know exactly when that start date is, but we've been preparing for it with meetings the last several days. We'll continue to do that, and once we get the green light we're going to have a very short window to make some decisions about this hockey team." "We're going to have a very short window to make some very difficult decisions going forward," Nonis said. "We don't know exactly when that start date is, but we've been preparing for it with meetings the last several days. We'll continue to do that, and once we get the green light we're going to have a very short window to make some decisions about this hockey team." Whether that plan includes Vancouver Canucks goalie Roberto Luongo remains to be seen. Toronto is seen as a potential destination for Luongo if Vancouver decides to trade him, and Burke said an upgrade in goal is something he was going to investigate during the offseason. Luongo, while preparing for the season in Florida, said Toronto is a place he wouldn't be averse to playing in. 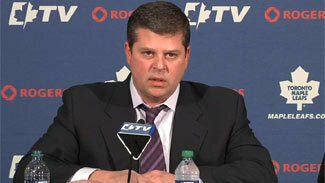 Nonis refused to discuss the Luongo rumors. "We never discuss pending transactions, first of all," he said. "Doesn't help get a deal done. Second of all, we're not permitted to do so. Players that are under contract to other clubs remain off limits from commenting." Nonis said he hasn't had any major discussions with any other GM. "I had a more difficult time getting a hold of my wife," he said. "I haven't been on the phone with anybody." But he knows those phone calls will start soon, and he's ready -- along with a management group that includes vice president of hockey operations Dave Poulin and assistant GM Claude Loiselle, as well as special adviser Cliff Fletcher. "We have some work to do," he said.